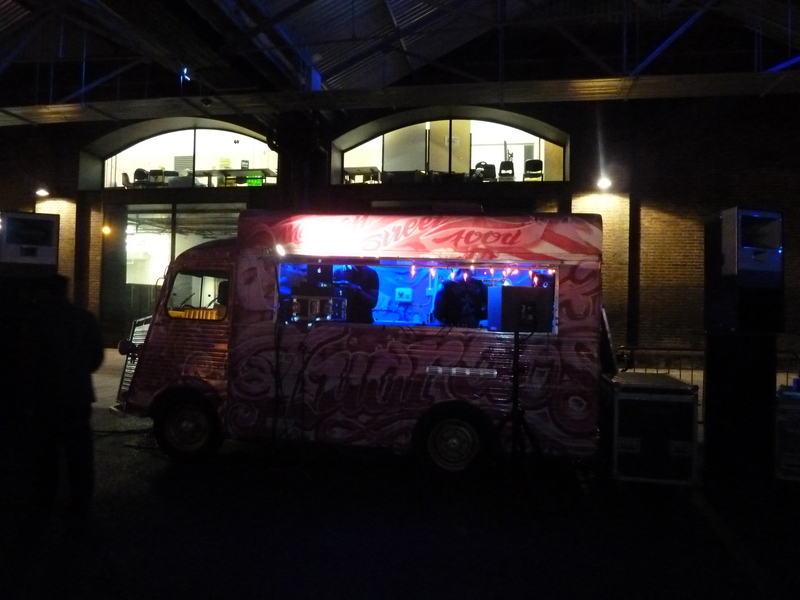 Kerb is a fantastic organisation that brings together quality street food vendors to make cities taste better. I was so enfoodiastic that the choice was almost overwhelming. 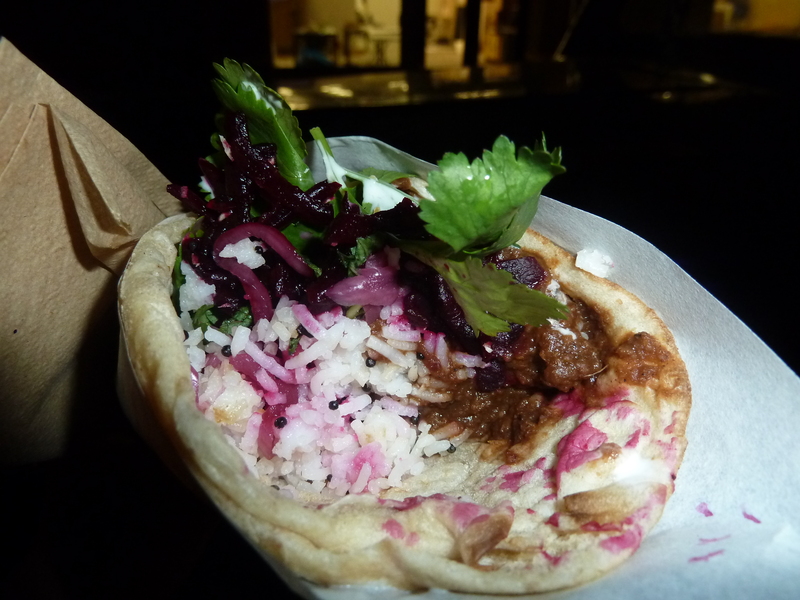 It was a tough call – I almost tried the lamb tagine. A future visit will be necessary. 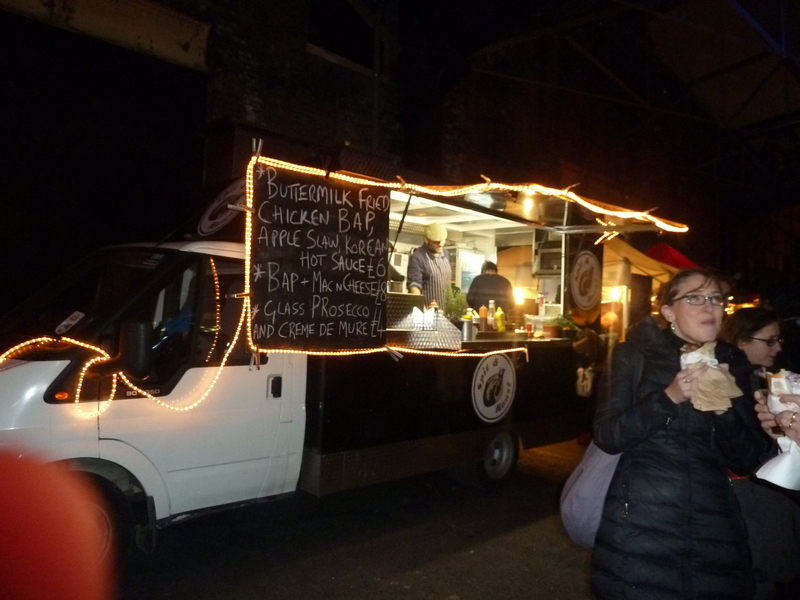 First up, I selected a Naan Roll from traders Tava Wava. 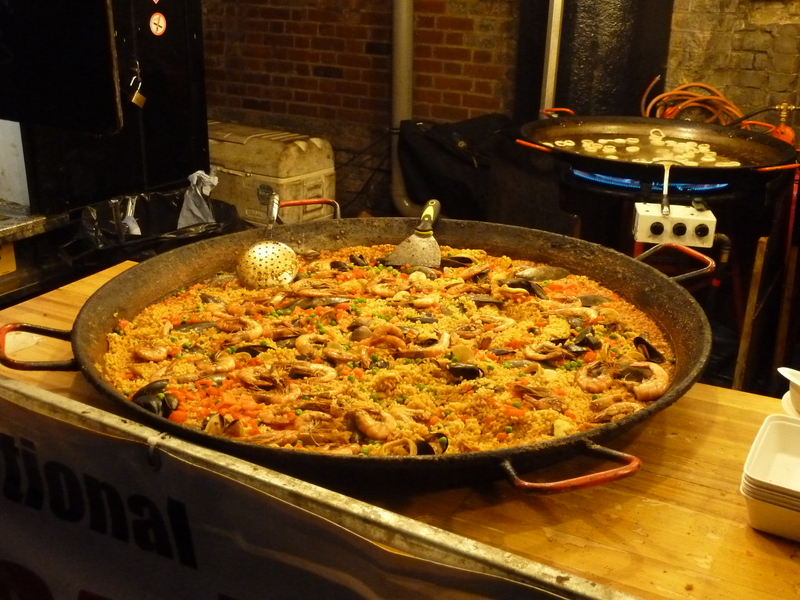 I was so hungry that I was nearly unconscious when ordering this, but I do remember a few details about the business. Essentially, one guy went to India, got inspired and wanted to bring the food back, whilst adding a bit of a British twist. Cue Beetroot Paneer Dahl and Coriander Chicken. Unable to decide, I got the combo for £6.50. The dahl was a little sweet for me, but the chicken was succulent and packed plenty of flavour. Plus fresh coriander is always amazing. Check out their Facebook for some great “making of the naan roll” photos. 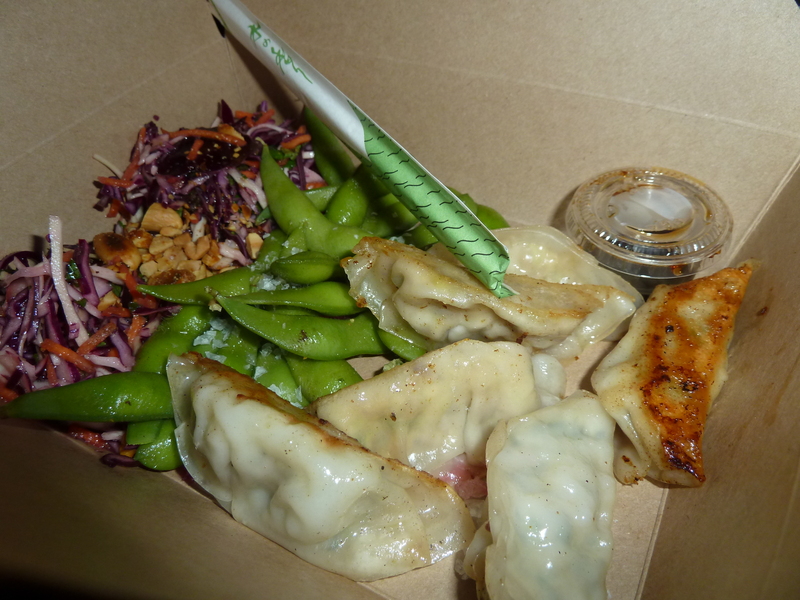 My friend Mimi got a gyoza box from Rainbo. These gyoza aren’t the usual minced pork, but include chicken and coriander, and mushroom and tofu for the veggies. 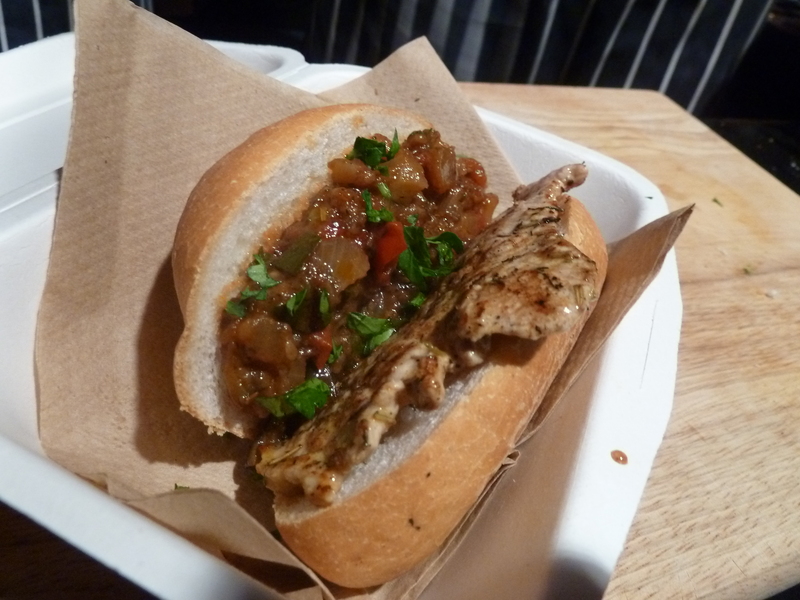 Not completely full from my naan roll, I hit Bocaface for a mouthwatering pork loin and aubergine mini-roll, for a reasonable £3. The owner roasts aubergine and courgette in the oven and then adds peppers and onions, fresh thyme, rosemary and a bay leaf. Simply fantastic. 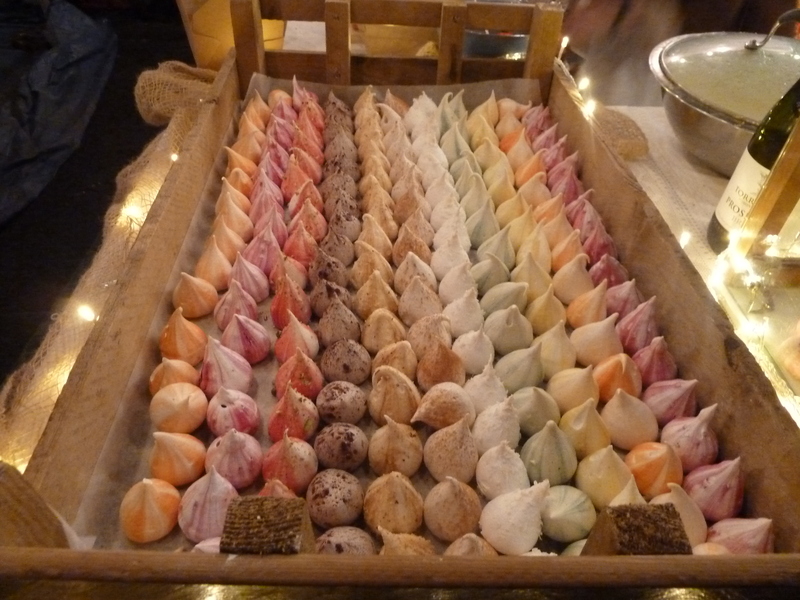 Of course, no meal is complete without dessert so we headed over to the Meringue Girls for a Meringue Apple Crumble (£5). 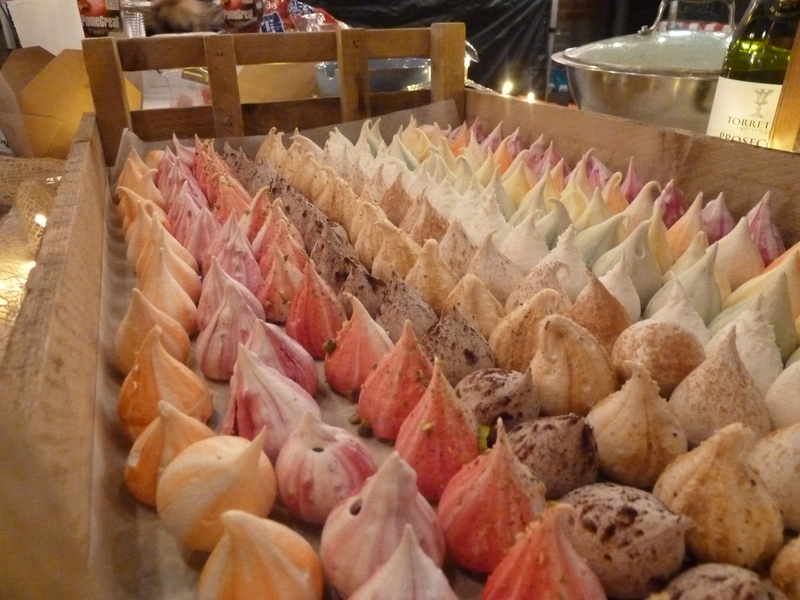 This involves sweet hot apples, covered in – you know – the crumbly bit, topped with TWO CINNAMON meringues and ONE 70% DARK CHOCOLATE meringue, covered in custard. 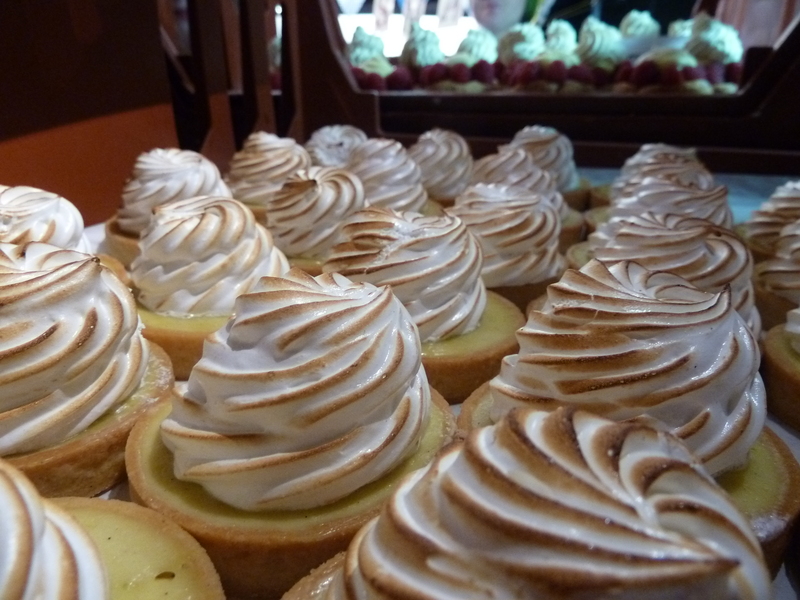 I might get murderous if don’t get to eat this again. Do not miss out on this. It is insanely good. 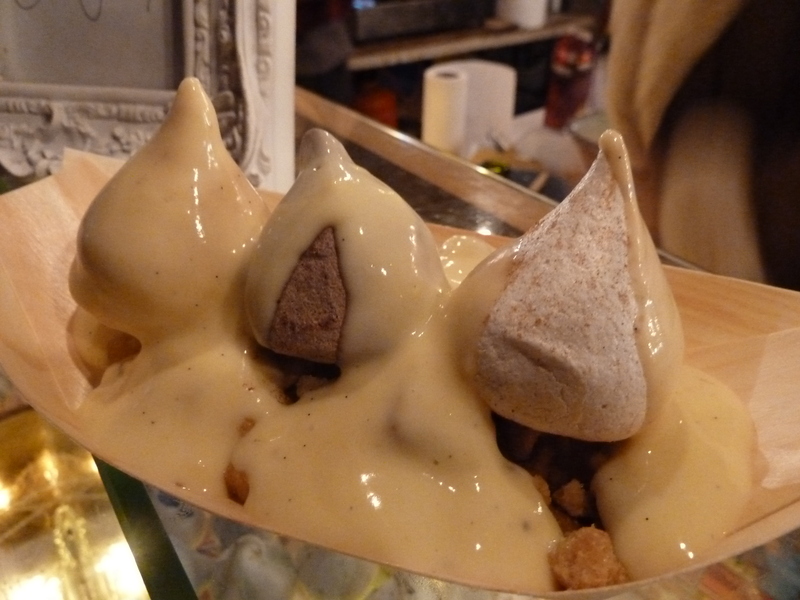 Meringue Apple Crumble – Oh how I worship thee! In true Pheebz Eatz style, I couldn’t quite leave my gorging at that, and stopped by Poppy’s Kitchen for a chocolate ganache pastry (£2.40). Too much sweet, not enough chocolate – but I might have just made the wrong choice. 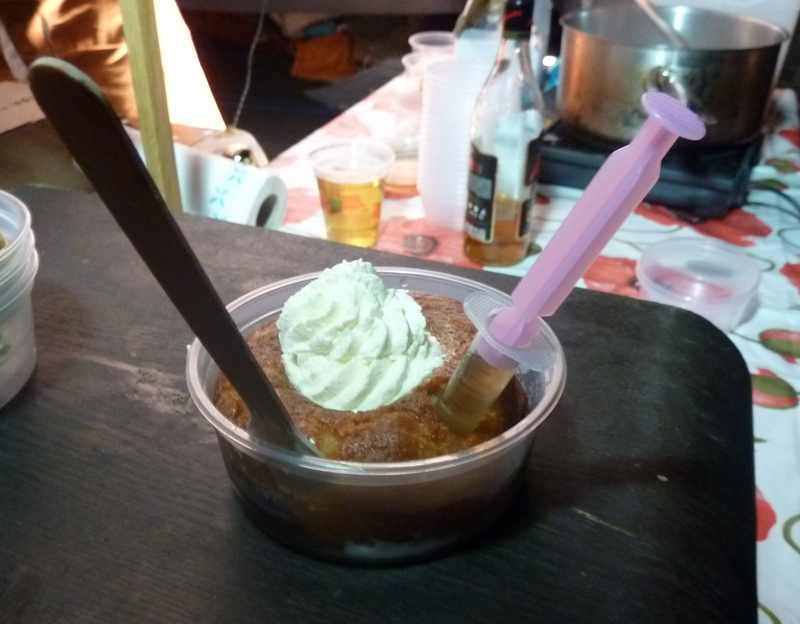 They have plenty of other tasty treats and were even serving a Hot Rum Baba with a syringe of rum! 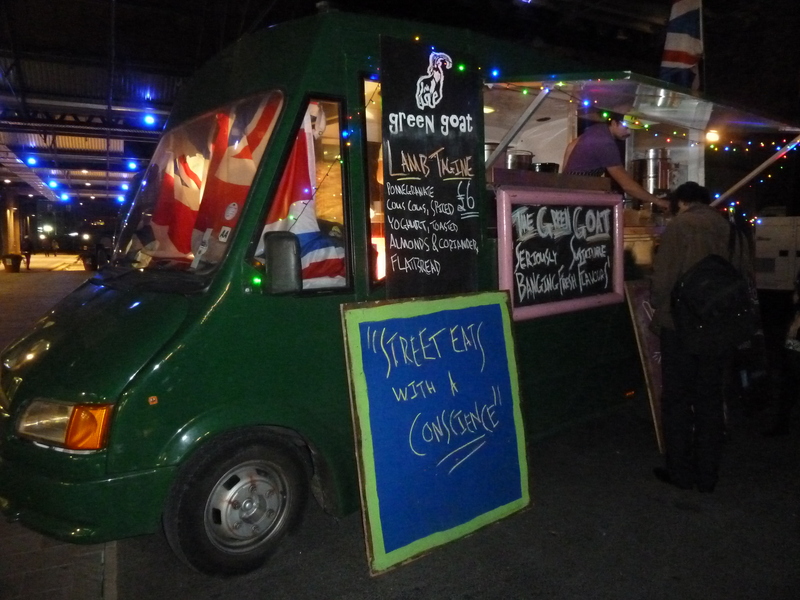 I’m usually very sceptical about street food. Too many times has a delicious-looking dish turned out to be bland and boring. 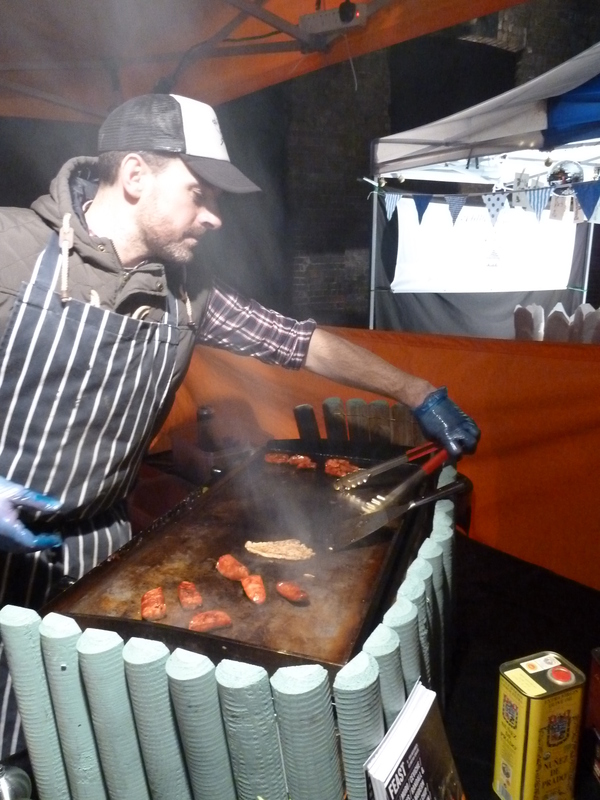 What really impressed me about the Kerb traders is that they all provided flavoursome food. It was actually as good as it looked. 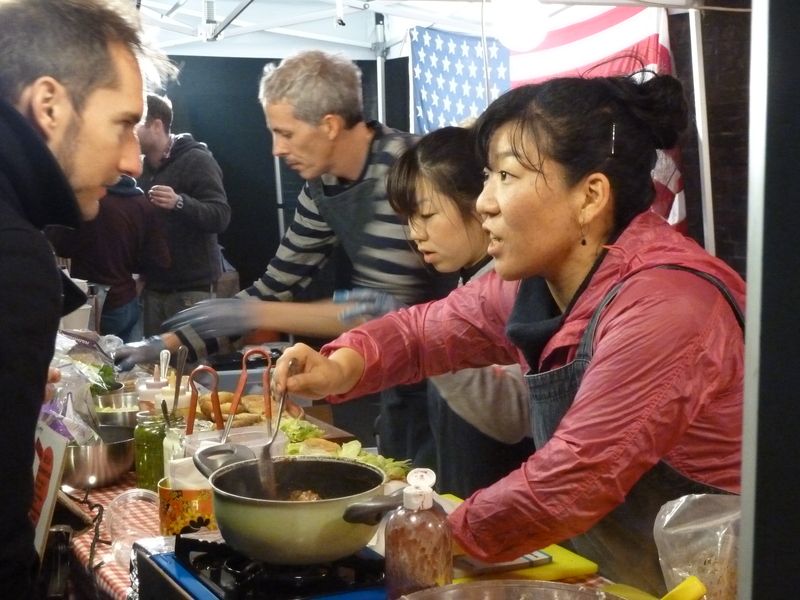 Kerb traders can be found at King’s Cross on Fridays and by the Gherkin on Thursdays. 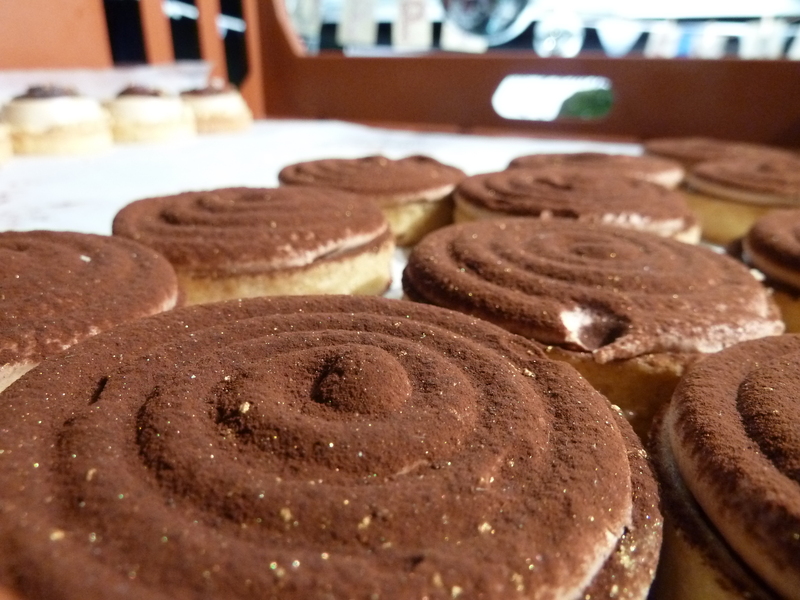 My next mission is to seek out Yum Bun, after reading other traders raving about them. They seem to be everyone’s favourite.